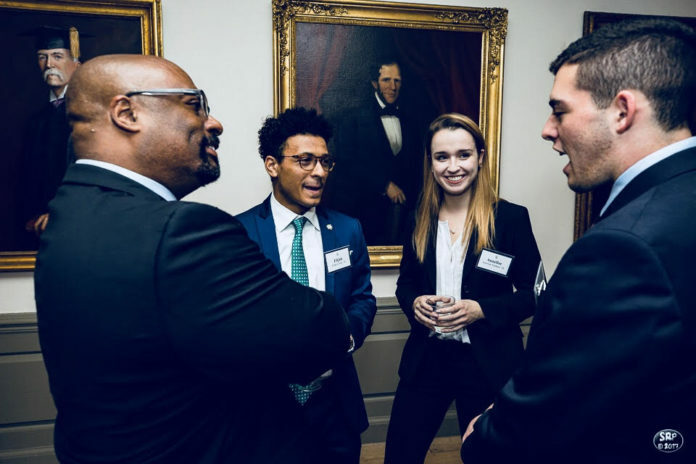 For most of his teenage years in McLean, Virginia, SA President Elijah Levine ’18 was set on attending the University of Virginia, studying business and securing a job after graduation at Barclays, a financial services company and multinational bank. However, after he attended events at the Raymond A. Mason School of Business with his father, he found himself considering the College of William and Mary. In just a few months, Levine will graduate and set out on a path much different than the one he once planned. This new path was first shaped in Levine’s first year at the College, when he took a freshman seminar with English professor Christopher MacGowan called “The American Short Story Since 1900.” Levine said this class prompted him to start writing more, and eventually led him to become an English major. His new academic focus, coupled with his personal redefinition of success, is what he said has helped him grow over these last four years. Now, Levine said he dresses and presents himself differently and prioritizes new things like reading literature and supporting social causes. “I think maybe in the past semester or two there have been times I stopped and thought about what defines me and to a large extent I am happy about it, and I realized how far it was from the person that entered William and Mary in fall 2014,” Levine said. Now, Levine argues in his thesis that to understand the spiritual context of “Howl” it is necessary to understand the works of Walt Whitman and William Blake. With funding from the Roy R. Charles Center, Levine visited Columbia University and the University of California, Berkeley to read some of Blake’s letters. Before Levine was elected to serve as SA president, he served as president of the Sigma Chi fraternity and vice president of programming for the Interfraternity Council. He also works as a staff writer for the features section of Rocket Magazine. What these positions taught him, he said, is the importance of communication, especially with the College administration. He cited his involvement with the creation of the Supporting Survivors program when he served in his IFC position as particularly formative. “[I learned] how crucial it is to have a plan but also be adaptable,” Levine said. That goes for his work with Rocket as well, Levine said. As a member of the features team, he learned to work collaboratively, both within his team and with his editors, to shape an idea into a fleshed-out magazine feature. “[Rocket’s] also just been an incredible way to meet so many people on campus, and it’s been super valuable in forming how I communicate,” Levine said. By the time Levine stepped into the role of president for his fraternity, with a study abroad trip to Cape Town, South Africa, fresh on his mind, he began to think differently about the relationships he had with the administration and student groups. One day, he asked former SA President Eboni Brown ’17, who had served as his orientation aide, if she knew anyone interested in running for her position. Six days later, he and SA Vice President Annelise Yackow ’18 had a plan. After what Levine described as the longest six days of his life, he received a Facebook messenger notification late into the night. It was from Yackow: she was in. Over his time as president, Levine said he has learned that it is helpful, and sometimes necessary, to ask for help. He said that he’s learned this through grappling with one of his biggest challenges: figuring out a diplomatic strategy for the position. Grappling with that balance along with his team, Levine said, has been the most productive part of his tenure as the president of SA. As his term comes to an end in just a few weeks, Levine said he is still looking forward to events he has in the works. Still, he is proud of the work he has already accomplished in connecting students, administrators and members of the Board of Visitors. Notably, Levine said he is pleased with how the SA budget supported programming over the past year, which included events like the second annual Sankofa Gala, a culminating celebration of Black History Month at the College. For Levine, the dream of working at Barclays after graduation is long gone. He recently accepted a job through Teach for America in New York City, where he will be teaching at a middle school in the Bronx. The importance of teaching and mentorship, he said, was first imparted to him through his mother, who used to work in the district attorney’s office in Mount Vernon, New York. While Levine said that he thinks teaching will be challenging, he hopes Teach for America will better equip him to communicate his passion for English in a way that enables his students to engage meaningfully with the coursework. “A curriculum has so much to do with who is expressing it, and the narrative that goes along with it,” Levine said. His last semester as a student at the College has also been a reflective time for Levine. He reminisced about his quieter moments on campus over the last four years, and about his love for long walks around campus listening and taking in the beauty around him. Now, he is looking forward to graduation and to the opportunities his class will have to be united once more. Last year, when he addressed the freshman class during Day for Admitted Students, Levine said that, looking out at the crowd, he marveled at the individual paths that would emerge from that one group of students and how that reminded him of his own class’s journey. Previous articleAmber Ox: Worth the Cost?